IFA 2011: Pioneer adds two universal players to Blu-ray range | What Hi-Fi? 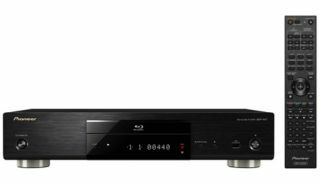 We've already reported on Pioneer's forthcoming BDP-140 3D/SACD Blu-ray player, and today at IFA details have emerged of a further two models to come. They are the £250 BDP-440 (below), due out in October, and the £350 BDP-LX55 (above) arriving a month later. The additional models are both 'universal players', with support for 3D Blu-ray, SACD and DVD-Audio playback. Twin HDMI outputs feature on the BDP-LX55 – handy for owners of existing AV receivers without 3D passthrough – while both models hook up to the internet via a wired ethernet connection. Pioneer's AS-WL300 wireless LAN converter is optional. There's also DLNA certification, support for MKV, DiVX Plus HD, WMV, WMA and MP3 playback, plus a jpeg viewer for photo slideshows. Naturally high-definition audio formats such as Dolby TrueHD and DTS-HD Master Audio are supported, and both models can be controlled using Pioneer's iControloAV2 app. Key differences on the BDP-LX55 are an 'advanced anti-vibration construction', the use of selected acoustic capacitors and a high-grade power supply. Gold-plated HDMI terminals and a 32-bit/192kHz DAC complete the upgrade.